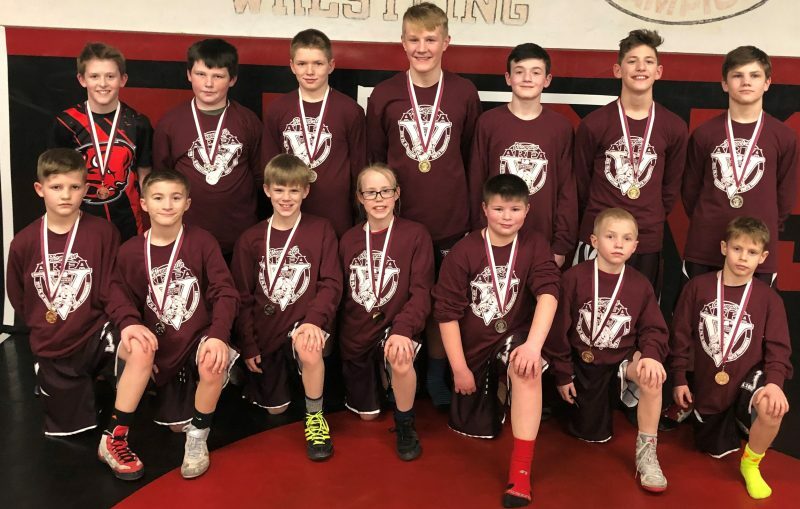 HYDE — Thirteen Clearfield Youth Wrestlers finished in the top-2 in their age group and weight class at the Area V championships at the Clearfield Area High School back on February 24. That qualified them for the March 16 and 17 Pennsylvania Junior Wrestling State Championships on March at the Peterson Events Center on the University of Pittsburgh campus. Pictured from Left to right: front – Colten Bumbarger 1st, Colten Ryan 2nd, Cash Diehl 2nd, Sonny Diehl 1st, Bradyn Wills 2nd, Bo Aveni 1st, and Matthew Rowles 1st; Back – Elliot Minor 3rd, Hunter Ressler 2nd, Ty Aveni 2nd, Carter Chamberlain 1st, Brady Collins 1st, Will Domico 1st, and Carter Freeland 2nd.